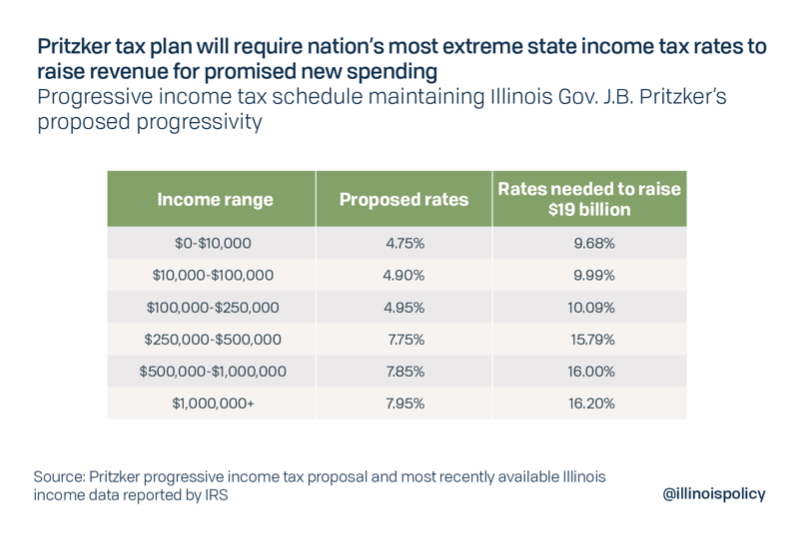 Every Illinoisan would feel the strain of higher taxes if progressive income tax rates were enacted that truly close the state’s $3.4 billion budget deficit. Illinois Policy Institute researchers found Illinois Gov. J.B. Pritzker’s proposed tax rates could not generate enough revenue to fund his spending promises without hitting middle-class Illinoisans with yet another tax hike. 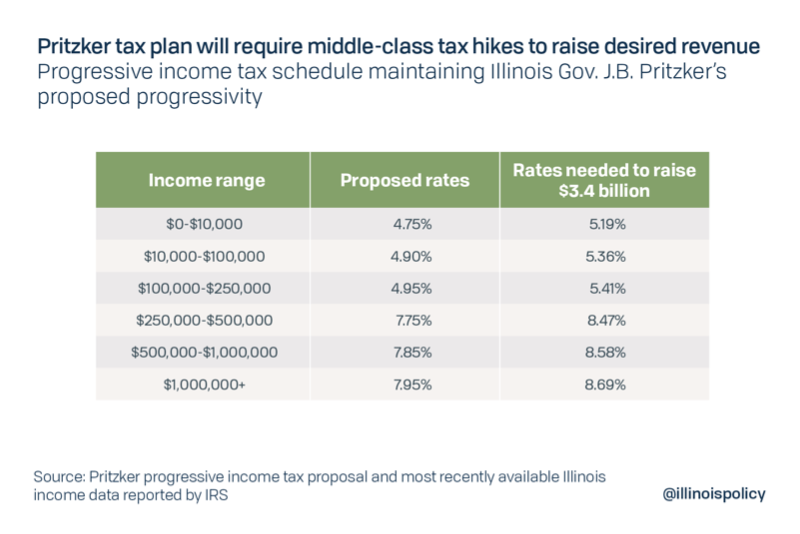 To close the budget gap, analysis from the Institute shows marginal rates would have to begin at 5.19 percent for Illinoisans earning less than $10,000, and would climb up to 8.69 percent for Illinois’ highest earners. The typical Illinois family would see a tax hike of $269 under this rate structure. These rates would cost Illinois’ economy $14 billion in forgone economic activity and more than 53,000 jobs that will never be created for job seekers. Meanwhile, in order to fully implement Pritzker’s promised spending of paying down bills, funding a capital plan, investing in K-12 and higher education and pursuing projects in his 2020 budget, the state needs as much as $19 billion in additional revenue. To raise that much revenue, progressive income tax rates would have to start even higher. Illinoisans earning less than $10,000 would see rates beginning as high as 9.68 percent, while Illinoisans making more than $1 million could see rates skyrocket to 16.2 percent, the highest rates for top earners in the nation. 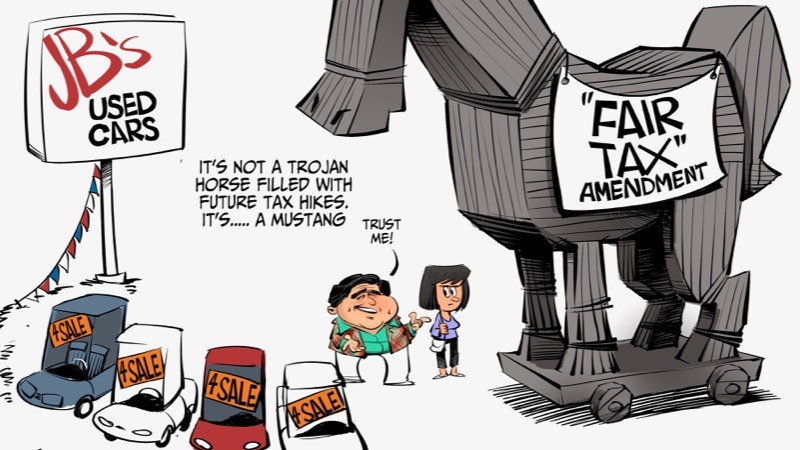 With such high tax rates, the typical Illinois family would see a $3,508 tax hike. This would result in $43 billion in foregone economic activity and 285,800 lost jobs. We don’t need to look into a crystal ball to see what’s happening: Gov. Pritzker’s proposal falls $2 billion short of revenue estimates, which means he will soon be back for more. This proposal is straight out of a playbook from Connecticut, the last state to enact a progressive income tax. Connecticut’s progressive income tax proposal started with a middle-class tax cut, but that quickly became temporary as rates continually increased to fund debt and spending. The downfall of Connecticut’s economy after enacting a progressive income tax foreshadows the negative consequences Illinoisans will face if Pritzker gets his way.